Indre-et-Loire was formed largely from the old historical province of Touraine. It is a major wine producing area and contains a vast number of small picturesque villages, which are well worth seeking out. In contrast, its capital, Tours, is a bustling city with impressive buildings that loom over you. 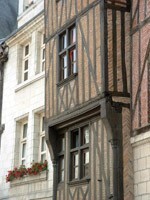 Tours is to be found right in the centre of the department alongside the Loire River. It is often likened to Paris, with its cosmopolitan and diverse atmosphere. There are wide boulevards making their way through the town, along which you can choose from a large number of cafés. The impressive Cathedral St-Gatien has been added to many times throughout its history, although is mostly of a gothic style. It is even more spectacular on the inside with its magnificent stained-glass windows. Tours has quite a few interesting museums. Among the best are Musée du Compagnonnage, which is a crafts museum, Musée des Vins de Touraine that will teach about the area's wine from within an old wine cellar (Vouvray and Montlouis wines are perhaps the most well known) and the Musée de l'Hotel Gouin, an archaeology museum. In the south of the department you'll find Loches, a medieval town with cobbled streets and white buildings. Its 11th century chateau has been home to four French Kings throughout its history and was also the site on which Joan of Arc convinced Charles VII to march his troops north to take the throne. The ramparts and towers that surround the town have been well preserved. Alongside the River Vienne, in the west of the department, sits the charming town of Chinon. It is rich in history and, at one time, appeared to have altered the course of France's destiny. In the chateau, looming over the town on a hill, Joan of Arc recognised the Dauphine despite his disguise. This was a test to see if God was really influencing her. In the town itself there a large number of pretty mediaeval buildings, the best being the Musée Anime du Vine, where you can learn about the production of wine and the manufacturing of wine barrels. The Château Chenonceau is one of the department's proudest possessions. It was built in the early 16th Century under Francois I and spans the Loire River. Over the centuries, it has been subjected to many improvements such as the creation of its pristine gardens. It can get quite busy, as it is very popular with visitors. Tours, located in the centre of the department, has its own airport making access very easy. Ryanair run regular flights there from the UK. Should you want to get to the very south of the department however, Poitiers airport may be a better option. Tours is popular with tourists and has a stable market, which represents good value for money. Together with the surrounding villages, this is a key area for gite owners and offers a year-round rental market. Do you know Indre-et-Loire better than we do? Do you have photos of Indre-et-Loire? The Indre-et-Loire department of Centre-Val-De-Loire is located in the west of the region.